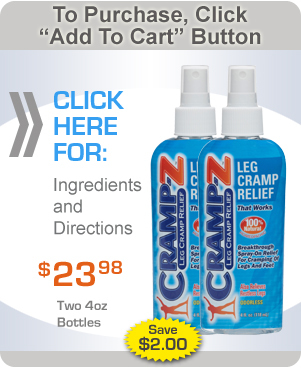 Cramp-Z is a revolutionary new way to prevent muscle cramps. When muscles get low on magnesium, they can cramp. Cramp-Z restores magnesium to muscles. Directions: Apply 4-8 sprays to muscle area and rub in throughly. For best results with leg cramps, coat both legs from upper thigh to ankle, twice daily. A third application daily can be used for added benefit.